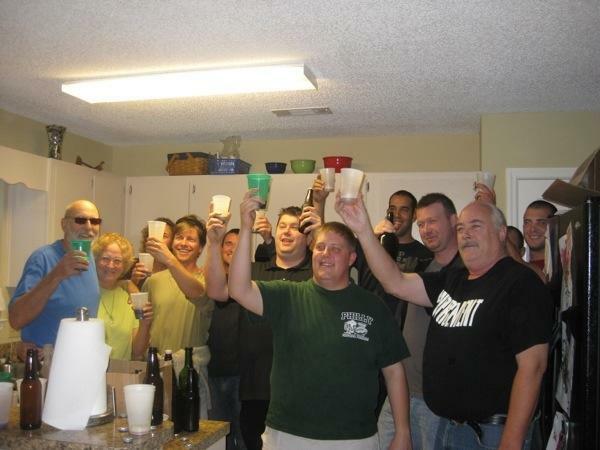 On Saturday evening Brian and I were very fortunate to have been invited by Scott and Kim to a homebrew tasting event. Scott and Kim had befriended Steve, owner of The Survival Shops, providing “Everything from Ammunition to Zinfandel.” Steve provides brewing supplies and he has formulated a club of local brewers. Approximately once every two months the brewers get together to sample each other’s creations. Brian and I tagged along for a most delicious occasion! We’d like to thank Steve and his wife, Kristin, for welcoming us to the event. We met some great people and shared our knowledge of brewing. We sampled wines: chocolate orange port, malbec, strawberry, and chianti. We sampled hard cider, pumpkin, and Yuengling (excellent duplicate of the lager, no headaches!). We sampled Belgian triple blonde, oatmeal stout, and dos equis. These brewers really knew their stuff! The beers were crisp, clear, smooth, and most had a nice head atop when poured. It certainly got us thinking what could we brew on a boat? Currently, we are working on ginger beer – gotta have the mixer ready for all that Carribean rum! This entry was posted in Uncategorized and tagged homebrew, survival shops by stephanie. Bookmark the permalink. You are too kind Stephanie, and are welcome to join us anytime, safe sailing.